The National Conference on Ending Homelessness from Nov. 5-7 is in Hamilton, and the city’s hosts wanted to share the impact Plan, Do, Study, Act (PDSA) Cycles has had on their efforts to end homelessness. 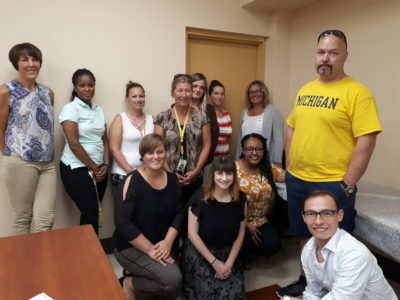 In this guest blog, read about how the PDSA method has helped transform Hamilton’s response to housing the most vulnerable. They will be sharing more as presenters at the upcoming conference. Plan, Do, Study, Act (PDSA) Cycles have launched Hamilton, Ontario into action over the past year. Hamilton’s Homeless Serving System has used this method to test approaches to shelter diversion and triaging individuals to appropriate housing solutions. Within a short timeframe, we Plan for a change in the way we work; we Do the change; we Study the change through structured evaluation; and we Act on what we learned. A big shout out to Community Solutions and the Healthcare community for teaching us how to “PDSA” and feel more comfortable failing forward! It’s a time of transformation and professional growth for us housing and homelessness folks. Like learning the steps to a new dance, our collective movements towards systems integration can come with its own missteps and off-beat rhythm. But it’s worth it! Participants in all of our PDSA Cycles have highlighted the benefits of coming together and shaking up the status quo for the people we serve. Recognizing that no one has all the answers, the PDSA method is a helpful way to start with small changes and test what works best to achieve the aim or goal. The fact that we may choose to abandon, adopt, or adapt the changes we test allows us to remain agile and take small steps forward, back, left, and right along the iterative pathway to ending homelessness. One small step for a community agency, one giant leap for ending homelessness! CAEH recently published a blog post on “why real-time data is the foundation for ending homelessness”. Performance measurement outcomes, indicators, and targets act as important milestones to gauge progress towards ending homelessness. Hamilton uses inflow and outflow data from our By-Name Priority List to identify on a systems-level gaps in our efforts to ending homelessness and areas of focus for continuous improvement. We then use the PDSA Cycle method to test small-scale creative and iterative solutions. Ending homelessness requires all players to keep a regular pulse on progress. The PDSA Cycle method can be used as a tool to rapidly react to findings in your data. For example, based on outflow data, Hamilton has brought together referral sources and destinations in a housing placement triage table. We are currently testing if this change improves triaging for individuals prioritized to permanent housing with supports. PDSA Cycles embed measurement plans upfront into the process to ensure there is a way to evaluate whether the change is working or should be … well, changed. As we embark on a new PDSA Cycle, we ask ourselves: What do we want to improve or test through this cycle? How will we know the change is working? What are 2 or 3 data points that will tell us if the change is working? Can we collect that data now? However, don’t fret if you don’t have that much data to collect! Communities that are not yet using data to drive their efforts can use the PDSA Cycle method to test how data can be collected. Celebrate the (seemingly) little things like being able to collect a new data point you haven’t been able to access before. We know that each effort towards ending homelessness is no small feat. We are thrilled to welcome you all to Hamilton for the upcoming CAEH National Conference on Ending Homelessness from November 5th to 7th, 2018. We will be presenting our learnings from our recent PDSA Cycle on shelter diversion at a men’s shelter in the community. Findings from this PDSA Cycle gave us a more accurate picture of what needs to happen to implement diversion across the board. In other words, we were able to dip our toes in the water before diving into shelter diversion on a larger scale. After smaller-scale tests, PDSA Cycles may take the form of follow-up tests or bigger scale tests with more people, places, or changes involved. Remember: PDSA Cycles don’t need to be extravagant and complex. A little planning goes a long way. Check out this PDSA Cycle template from Community Solutions that may help you get started. It’s a test cycle! You have a choice to abandon, adopt, or adapt what you are testing based on the results. You don’t need to build the whole plane before you find out if it flies. It’s data-driven! PDSA Cycles can be used to test solutions that address areas of continuous improvement identified in your data. If you don’t have that much data to work from, PDSA Cycles can be used as a way to test how data can be collected more regularly or efficiently. Additionally, PDSA Cycles incorporate evaluation into the planning and execution that boosts community familiarity with collecting data to assess whether the change is working. It’s a jumpstart to bigger projects! It’s a quick way to get started on far-reaching or nebulous projects. PDSA Cycles allow communities to break down larger pieces of work by testing and evaluating smaller changes or ideas. This blog post was authored by City of Hamilton staff inspired and dedicated to Canada’s ending homelessness work. See you in the Hammer this November! 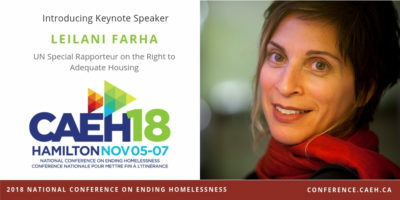 Next week’s National Conference on Ending Homelessness in Hamilton will feature UN Special Rapporteur on the Right to Adequate Housing, Leilani Farha as one of the expert keynote speakers from Nov. 5-7. The conference features 77 concurrent sessions and over 200 local and global presenters. It’s our biggest one yet! Although registration has closed, you can email caeh@goldenplanners.ca to be put on the waitlist. We’ll be live streaming the keynote speakers on our Facebook page too. Be sure to check out or use #CAEH18 on Instagram and Twitter during the conference, as well, so you don’t miss anything!